Whoa doesn't begin to describe my incredible experience at CES2018. It was amazing, mind-blowing and exhausting at the same time. For the third year in a row, Coldwell Banker has sponsored the Smart Home Marketplace. I traveled to Las Vegas as part of Coldwell Banker's Blue Crew, a group of agents and marketers that shared their experiences from the show floor. Here's a short recap of my time at CES 2018! I spent the majority of my time here. One thing was clear, Google Home is fighting hard for the top spot in voice assistants. Google was all over the show floor with pods and actual "assistants" at many of the booths. It's clear that the focus is integration. While Google's physical presence dominated the show floor (they always put on a good show), but Amazon Alexa won with more built-in product integration. It was incredible to see cutting-edge innovation and learn about the future of smart home. Amazon Alexa isn't limited to the speaker that you see in people's living rooms or kitchens anymore. Honeywell's new all-in-one security system has Alexa inside it as well as a 10180p HD camera with face recognition software, multiple sensors, night vision, two-way audio. For a smaller home or apartment, this may be the only security you need. Kohler's new lighted mirror is the first of its kind to have Alexa built-in. It's motion activated, voice-controlled, dimmable LED light that you can adjust based on your lighting needs. Imagine asking your mirror for the weather report...well, now you can. I spent some time at the Somfy booth to talk about their smart home security products. Somfy is a french company that is making their entry into the US smart home security space with the Somfy outdoor camera. The camera recognizes whether the movement is from a person, car or animal with their person detection software called SomfyVision. If a person lingers in range, it's also equipped with a customizable voice alert so you can literally tell people to "GET OFF MY PORCH!". The camera won a CES Innovation Award. There was so much to see and learn about at CES that if I wrote them all here, you'd spend a few days reading. I'll be writing additional product blog posts so stay tuned! WHY DOES SMART HOME MATTER? The ubiquity of smart home products will continue to increase. We are living in such an exciting world where we can interact with items in our homes in an intelligent way. As real estate professionals, we have to be aware of what products are installed in the home so that can convey the benefits to that prospective buyer. The beauty of smart home is that it is customizable to the needs of the people living in the home. Smart, connected products will give a home an edge over the competition if we can show the safety, security, convenience and savings that it can offer. Can you tell that I'm excited?!? As I planned my trip to CES, Eureka Park stood out as a place that I definitely wanted to check out. There are start-ups from all over the world and it is all about launching new products, services or ideas and crawling with start-ups. Investors visit Eureka Park to find that awesome new product to take to market. Here I found things like Robomart, a self-driving grocery store. I also got to try out the ModoBag (watch here), a motorized carry-on that you can ride. Then there's Bautiful Box, a "pet sitter" that will entertain and train your pet while you're away. Easy Rain is a start-up that is trying to solve hydroplaning in your car and save lives. If you plan on attending CES in the future, Eureka Park is a must see. The week at CES went by in a flash. I'm still gathering information about everything I learned and saw. A friend on social media commented that it looked like I was a kid in a candy store. What an incredible way to start 2018. Thank you so much, Coldwell Banker!! 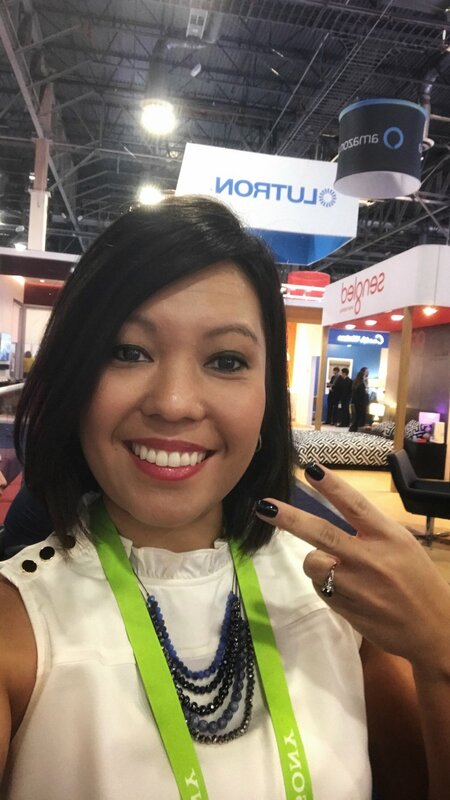 Enjoy the photos below and feel free to connect with me on twitter at @angelpiontek (take a look at all my CES posts there - #cescb) and check out the Coldwell Banker CES blog! Android Things Drawbot drew my selfie!